"Prove to me that you're divine"
Patrick Cassidy sharing his personal stories with the class. Anisa Henry singing "I Don't Know How to Love Him" in the role of Mary Magdalene. Note: Anisa could only attend the AM class. Josh Peduto singing "Gethsamane" in the role of Jesus. In class, we visited with the director, Patrick Cassiday, and cast of Jesus Christ Superstar. Patrick shared with us some personal stories about his mother, Academy Award winner, Shirley Jones; his brothers - David, Shaun, and Ryan Cassidy; his sons Jack, who was recently seen on The Voice, and Cole; his niece Katie Cassidy, from CW's Arrow; and growing up in a famous Hollywood family. We heard about his life on the road, Braodway career and his passion for teaching. In addition, we unpacked Patrick's concept for Jesus Christ Superstar including the inclusion of Jesus' positive qualities. After viewing the performances by cast members in class, what excites you the most about seeing Jesus Christ Superstar? As mentioned in class, Jesus Christ Superstar is a sung-thru musical also known as a Rock Opera. How do you see the non-stop singing benefiting or distracting from your ability as an audience member to suspend your disbelief? Why? When first released, Jesus Christ Superstar was received with numerous protests from religious organizations angry at the lack of divinity in the storytelling. However, through the years the protests have diminished and this production has been so well received within many religious communities, that some churches even produce the show. Based on your knowledge of the production and faith in America, why do you think the protests have diminished? In class, Patrick shared the opening of the musical that he created. This includes the voices of Martin Luther King, Jr., Robert Kennedy, and Mahatma Ghandi followed by gunshots. How does the inclusion of these speakers and the sound effects frame the production? As always, we try to make comparisons between current class content and previous class content. Compare and contrast Jesus Christ Superstar with any previous class content. Professor Sparks stated that Musical Theatre is the most collaborative art form. 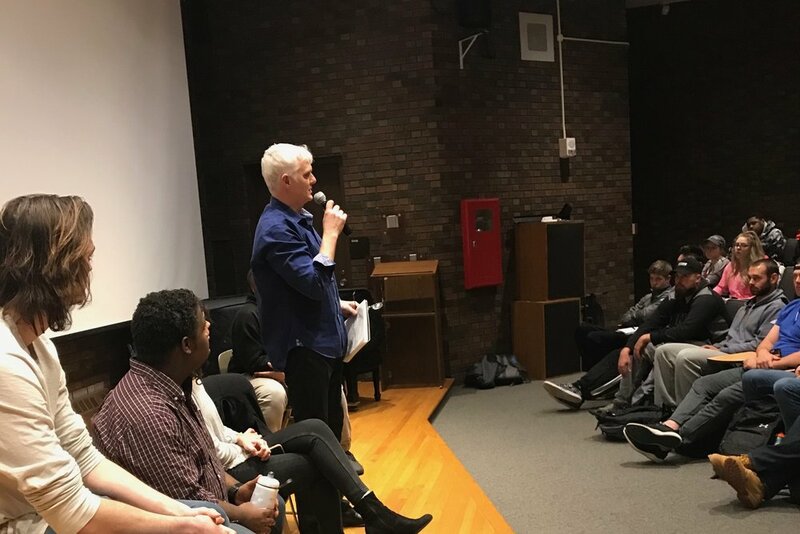 In class, Greg Jones, the assistant director, shared his role as a student staff member in the production. Based upon your experiences with group work and leadership roles, how do you see the role of Assistant Director challenging? Keeping in mind the context in which Greg is working as he directs his peers and assists a guest director.